Slazenger golf balls are the next to be entered into my best golf ball challenge. Just like with all of my golf ball reviews I will play one 18 hole round at Rackham Golf Course near my house and report my findings after each round. Every time I play a Slazenger golf ball I will update it here. Why on Earth am I playing a 10 year old golf ball? It’s because my dad never played them. There was dust on the box when I picked them up so it leads me to believe they had been sitting for awhile. I remember seeing them sitting on the shelf in his workroom because the box has a shiny hologram cover. I do not know when these Raw Distance were made as there is no manufacturing date on them. Lets say they were made in the mid to late 2000s. You can see the dust on the box. Doing some searching I could not even find a similar packaging. Slazenger switched to a longer rectangular packaging instead of the typical square packaging. Mine were in the square packaging. 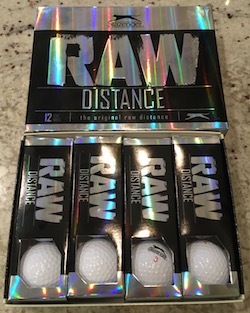 I like how it says “the original raw distance.” There are other raw distance golf balls? Let’s see how raw it is. 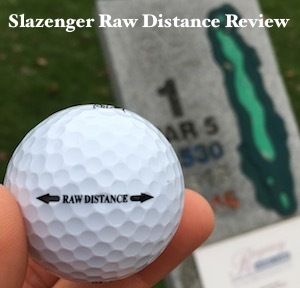 Off The Tee – With it being a cool damp day it limited the Raw Distance from going as far as other golf balls I tested. But that doesn’t mean it didn’t go far. The Raw Distance seemed to have a second gear in mid-flight. With it being a two piece ball it meant the Raw Distance was not going to spin that much. And my testing would agree. Hit three draws off the tee and a number of straight shots. Did not slice once. The Raw Distance did seem to reach the outer limits of my driving distance. On a warm dry day it might be the longest golf ball I’ve ever hit. Fairway Woods & Hybrids – Noticeably longer with fairway woods. My impression would be 10 to 15 yards longer than other golf balls with these clubs. Spin was low and distance was long. Almost landed my second shot on the Par 5 14th green from 250 yards away. It landed just right of the green in the air and settled in the rough pin high. When I have hit the green with Nike golf balls it was the same 250 yard shot but the balls landed at 235 and bounced up there. Irons – With the extra distance I was getting off the tee it meant shorter iron shots into the green. Out of my 9 greens in regulation eight of those were with irons. Distance was longer with irons too. Had to club down a couple of times because the Raw Distance was carrying further than other golf balls I’ve tested. Spin was average. When I hit the green it took a hop or two and stopped. No crazy backspin or sidespin and that’s ok. Pitching Wedge. 8 iron. 8 iron. Wedges – Almost chipped in for birdie from 30 feet away on the Par 3 13th. Outside of one bunker shot I only had one tricky chip shot. What I liked about the Raw Distance and the wedges was I knew it was not going to check up. All I had to do was get the ball half way to the hole and let it roll. Got up and down for par on three separate occasions. Putting – And this is where the Raw Distance had problems. Three putted four times and four putted once. I could not get a feel for it on the green. The Raw Distance does not have a soft feeling leaving the putter face. It’s very clunky. In its defense, the greens were wet from an early morning rain. For the first 8 holes the golf ball would pick up water from the green and create the “mohawk” effect. This is the only time the greens have been like this during all of my tests. It made putting a lot more difficult. When you think its going to be slow it was fast. And vice versa. It’s too bad because if I could cut the three putts in half and get rid of the four putt I break eighty. Durability – The Raw Distance is a tank. There was one little scuff mark but besides that it was ok. You could get more rounds from it for sure. I used to really like playing Slazenger golf balls when I was a kid. I felt lucky when I found one on the golf course or in the Clinton River behind my parents house. There was something cool about Slazengers. I’d be interested in trying a newer generation Raw Distance to see if it still gets the distance as the 10+ year old one I played but has a better feel on the green. All things considered I thought the Raw Distance was a great golf ball.